ClearPath and the Carbon Utilization Research Council, with support from the mine workers and other unions, recently came out with a study forecasting some really big benefits that underscore the economic promise of using captured carbon from power plants for enhanced oil recovery: up to 780,000 new jobs and $190 billion in added GDP by 2040. By 2040, the study (using modeling provided by NERA Economic Consulting and Advanced Resources International) forecast between 17 to 87 GW of coal and natural gas power plants with carbon capture. And that, in turn, these plants could lead to up to 920 million barrels of increased annual production of domestic oil by 2040 (not to mention lower electricity rates)! It probably does until you hear that market-driven capture is already taking place – and has been for nearly half a century in the United States and it all originated in Texas. How does enhanced oil recovery create low-carbon oil? Unsurprisingly, Texas didn’t do it for environmental altruism – there’s a clear economic benefit. 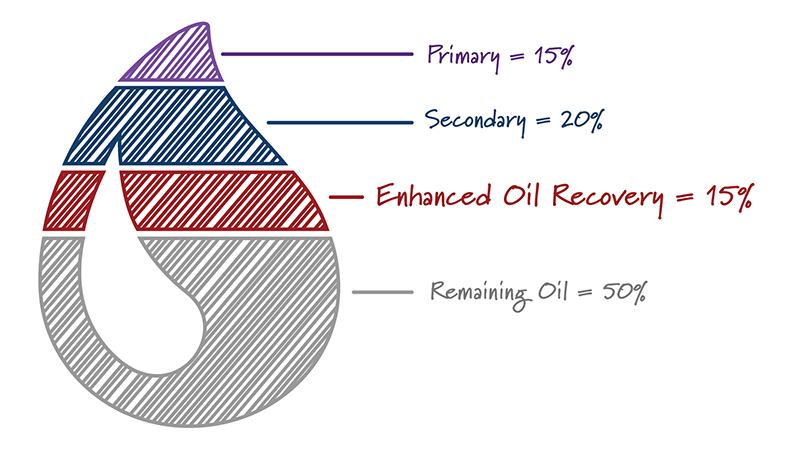 Conventional oil production is a relatively inefficient process, leaving behind 50 to 70% of all the oil in the ground. 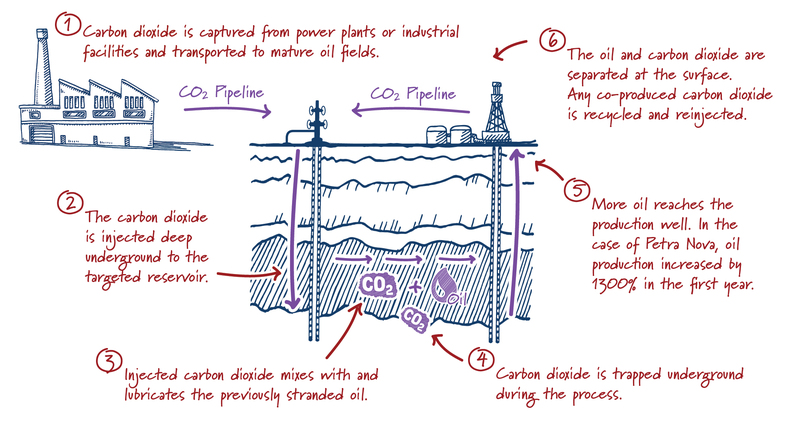 To tap these “leftovers”, oil companies often inject carbon dioxide into their oil fields increase production. Carbon dioxide increases reservoir pressure and lubricates the oil, helping to extract additional oil. Spurred on initially by necessity during the 1970s energy crisis, Texas petroleum engineers are more familiar and experienced that than anyone else in the world. The University of Texas is a leader in refining chemicals and processes to capture carbon emissions from power plants.2 The University of Houston has a partnership with Oil India.3 ExxonMobil (along with many of the other supermajors) are developing next generation carbon capture solutions.4 Last year, Secretary of Energy (and former Texas Gov.) Rick Perry cut the ribbon at the Petra Nova plant near Houston, the first large-scale carbon capture facility at a coal power plant in the United States. Earlier this year, a $150 million pilot power plant began testing to prove a new fossil power plant design outside of Houston. And the international race is underway: there’s over 12 other countries with active test centers at major economies around the world, including Norway, China and South Korea. Certainly, significant technical and policy challenges remain. 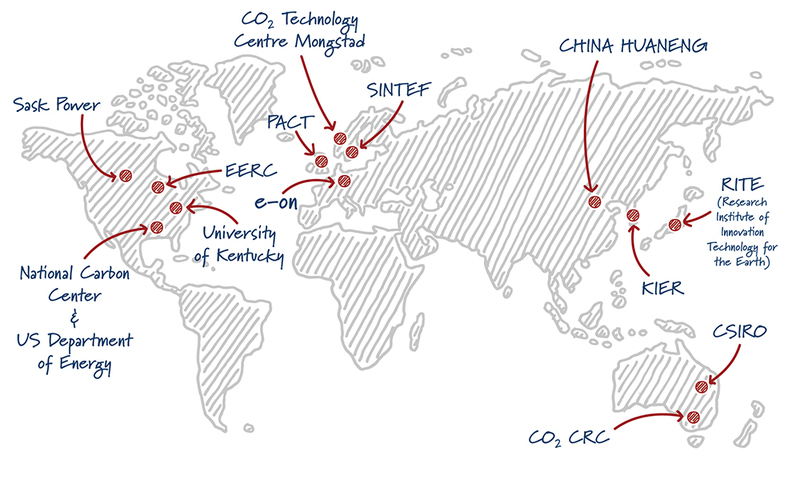 Today, in the United States, all but one carbon capture facility is done at industrial facilities which produce more pure streams of carbon dioxide and have cheaper capture costs. The technology also faces stiff competition in power markets, often requires integration of many capital-intensive steps and assurances that energy policies do not discourage development. Yet the tantalizing benefits of unlocking low cost capture technology are significant. In the CURC-ClearPath analysis, low capture costs (unlocked by an aggressive research and development program) resulted in two to three times more deployment than a baseline cost case. As our study found power plants with carbon capture has vast market-driven potential, but a strong public-private partnership is needed to make our study’s forecasts a reality.